1) Plan ahead. Many mornings I would sit down at the computer to write a post and I had no idea what my post was going to be about. I spent hours trying to make each post unique and interesting. Sometimes I was successful, other times… not so much. The “theme” days were helpful in filling in the gaps. 2) Read other blogs and make comments. I found several ideas from reading other blogs. Ideas that I could use immediately, and some that I will be able to use down the road. Commenting on the blogs that struck a cord with me helped me to build relationships with people I would never have met outside of blogging. Now, I want to visit new places and learn more about the people who have already explored them. 3) Discipline. I had to make myself accountable for every post. It had to be something of worth, even if just to say, I’m still here. Through the Blogathon, I’ve come to realize just how much time must be committed to writing. 4) Have fun! There is a great reward in reading and writing humorous posts. Everyone needs a smile now and then. Share what you’ve learned from reading or writing blogs. Congratulations! I’ve bookmarked this post – will help to re-read it every now and then! Thank you Rosanna, I appreciate the kind words. I’m heading over to your blog now to catch up on more advice as well. 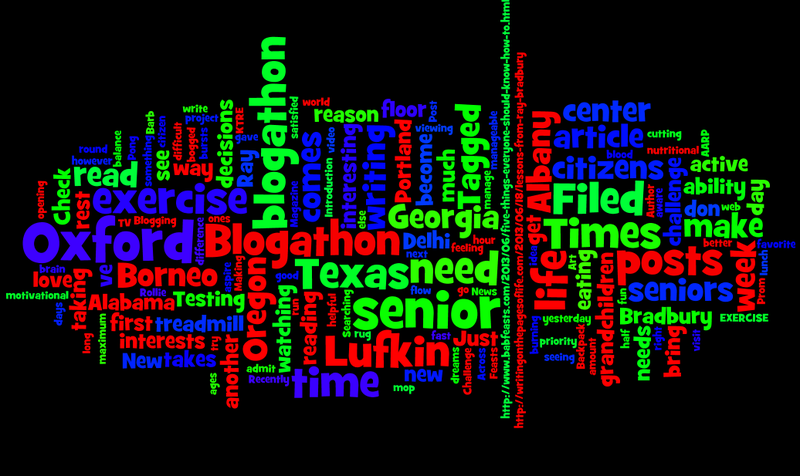 It’s been a great experience participating in the blogathon! If I’m curious about a subject or need to do research, I prefer reading a blog about the subject. For example, last night I needed to get some information about “how it is living with TBI” (traumatic brain injury. That many of our veterans suffer from.) Reading about someones life, on their blog, helps me get a picture in my head of how it is. No dictionary could do that. I really appreciate getting to know you Diana! Thanks so much Maria, the feeling is mutual. About Traumatic Brain Injury, I have a brother who fell when he was 30 (24 years ago) and suffered a fractured skull. He was in a coma for 18 days, had to have part of his skull removed to relieve pressure, a shunt to remove fluid, you name it, he experienced it in that department. He was in rehab for another three months, but due to his uncooperative behavior, they released him; still bull-headed even after the accident. Anyway, if I have any information I can offer let me know, I’ll try to help. I’m also asking for prayers for a young lady who suffered a brain aneurysm a month ago. She is recovering slowly, but only time will tell to what extent. That’s the thing with brain injuries, each is different. Well, I didn’t mean to rattle on. The blogathon has been a great experience. Hope to remain in touch with all the people that have become friends over the past month.